Few, if any, modern poets have stood up against the wave of decay and mediocrity that has inculcated modern culture. For Sanfilip, poetry’s lack of importance to modern culture is indicative of a deeper trauma at work. In Poetry in the Age Impurity, he spells out the end game of our culture’s long refusal to face true existence and exposes the false mirror modern society has created for itself. In Sanfilip’s view, the death of poetic consciousness is emblematic of the crisis at hand. At the same time, he points a way both outward and inward to the perilous, metaphysical path necessary to find true being beyond the vacuity he sees swallowing up the West in ennui, cynicism and self-hatred. He challenges the warped values of our time, while at the same time laying out a psychic road map back to authenticity. Not since Shelley’s A Defence of Poetry or the Surrealists manifestoes of the 1920’s has a living poet been willing to stand up against the tide of decay eating away at the heart of modern society in such profound and articulate language. Poetry in the Age of Impurity is a courageous poet’s attempt to reclaim the stilled voice of prophecy lost in the babble and irrelevance that has become the fabric of modern society. Many have found respite in poetry. Lyrics have indulged, sonnets have intrigued, songs have serenaded, but this is the modern age. Poetry today lacks that old school charm and gracefully woven meaning. The Muse seems as divorced from her poet as can be. 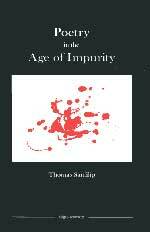 This is Poetry in the Age of Impurity as chronicled by Thomas Sanfilip. With books such as The Art of Anguish, The Killing Sun and By the Hours and the Years to his credit, Sanfilip has contributed to modern literary criticism, and that of poetry in particular. In his latest, Poetry In The Age of Impurity, he laments the lack of importance of poetry in the modern age. The existential dilemma is highlighted, and the poet is accused of playing puppet to society’s demands. Sanfilip stands for the ideals of poetic expression, freedom, and creativity. He pins the gateway to resurrection of poetic brilliance on the awareness of freedom and the embracing of creativity. A poet must be able to break away from the shackles of the “misconceptions of his time.” It is only then that he will achieve organic unity with nature, the ultimate objective of all poetry. A lot has been said about poetry in the modern age. Many critics have expressed their disappointment about the lack of modern poetry to measure up to the magnificence of the age gone by, but Poetry in The Age of Impurity is not to be classified as one among the many. It goes a step beyond. Sanfilip speaks of the “mythos of existence,” the shared oneness of poetry with its poet. “Poetic failure is in truth the outer manifestation of our human failure.” He directs modern poets towards the way out of modern redundancy, being real to the poetic self. The world is ever changing, and some view it as not always for the better. Poetry in the Age of Impurity is literary and poetic criticism from Thomas Sanfilip who discusses modern poetry and what he views as its failings, the changing values of the world and the failing nature of poetry to combat or properly reflect those values. Poetry in the Age of Impurity is worth considering for those seeking a very critical discussion of the modern art.